La Milagrosa is an anti age cream, it helps in the elimination of acne, scars, dark spots, wrinkles and any unwanted imperfection in your skin. Helps exfoliate, hydrate, clarify and regenerate the skin. With softening effects rejuvenating your skin. Made with 100% natural ingredients La Milagrosa is the most healthy and nutritious cream for your skin. La Milagrosa is a brand known worldwide for its quality, effectiveness, satisfaction, skin friendly and with all its natural ingredients. La Milagrosa Cream is no longer manufactured in Mexico, ALL La Milagrosa creams that say they are made in Mexico or direct from Mazatlan, Sinaloa are FAKE, in Mexico it is no longer manufactured. We are the exclusive manufactures for sale and distribution in the U.S. This cream is authentic, made by hand keeping its original formula with high quality ingredients. Turning our cream and our products in the best quality of the market. La Milagrosa is the perfect cream for you. Now reinforced and improved to give you optimal and fast results. La Milagrosa now with its authenticity hologram to give you better confidence and security in our products, which distinguishes our brand from the rest. This brand has a federal registration of USPTO (Reg. No. 5406031). Look for our hologram and stamp of authenticity to avoid imitations and fakes. 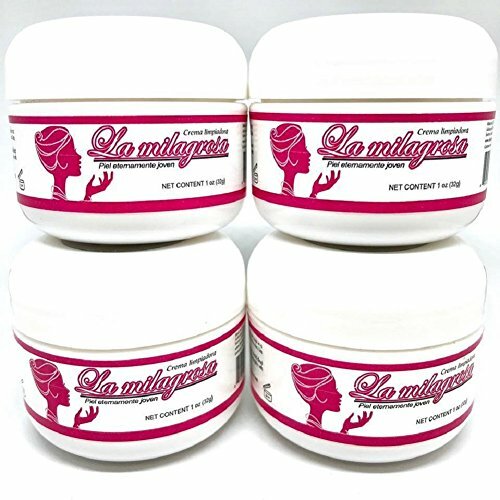 La Milagrosa is an anti age cream, it helps in the elimination of acne, scars, dark spots, wrinkles and any unwanted imperfection in your skin. Helps exfoliate, hydrate, clarify and regenerate the skin. With softening effects rejuvenating your skin. Made with 100% natural ingredients La Milagrosa is the most healthy and nutritious cream for your skin.